One in twenty children has ADHD. Substantial functional impairment accompanies the disorder—including elevated risk for serious accidents, problems in peer and family functioning, and below-average academic achievement. 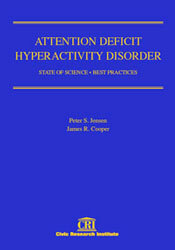 This critically acclaimed reference surveys research in epidemiology, neuro-psychotherapy, neurobiology, psychopharmacology and psychotherapy, providing an authoritative review of the state of the science on ADHD diagnosis, causes, treatment and outcomes.